Only 4 more sleeps until the Superstore Retreat!!!! How exciting!!! I cant wait!!! Luke's forehead healed really well. It is still scabby but its all good. Then this morning as he was watching me wash up he fell of a chair and hit the back of his head and now has a egg there. No split this time thank goodness! Its wet and cold here so poor Luke must be so bored! We cant go outside and play on the swings. All we can do is play blocks but that gets a little boring after a while. We have watched Nemo which Luke has really enjoyed and we shared a cup of soup. I think I may pull out the pencils and colour in for a while. I doubt gross motor will be on at the school today - last term I only went about 3 times to help out as it was cancelled all the other times! Oh well. Not much scrapping has been happening here of late. 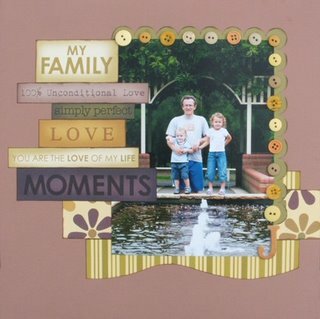 Here is a DT layout I did for Memory Bugs using We R Memory Keepers papers. I love that stuff! So much so that I was really naughty and bought the entire Boho Chic line from Linda's new shop. By entire I mean entire! Ribbons, tags, alphabet, goodie box and 2 of each paper! Talk about a splurge! LOL! I dont do it often and it is just divine! Anyway, thats about it thats happening in my life at the moment. Not much really. Wow, your having a run of bad luck with Luke lately Beth. Hope the eggs heal well. The LO for Memory Bugs is stunning as always, I always love your LOs. Glad to hear Lukes cut healed well but bugger about the egg..typical boy!! I adore that LO it looks great. Lucky for you going on a retreat...have a ball! Love this lo Beth...have fun at the retreat! Have fun at the retreat... Love that LO! Beth enjoy the retreat and your family layout is great! Jee Kate looks like you!